As I mentioned in my 1500 Follower Giveaway #1 post, I recently reached 1500 followers! As a way to say THANK YOU, I'm having a couple of giveaways here on the blog! 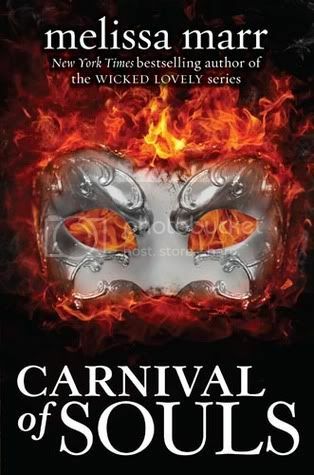 Today's Giveaway is for Carnival of Souls by Melissa Marr! And don't forget to check out the other giveaway going on as well. Book will not ship until it's release date. Yes! The first three books of her Wicked Lovely series and Graveminder. Thanks! Yes. Yes I have! I read her Wicked Lovely series and her adult debut Graveminder! And a handful of short stories too! Yes, I loved her Wicked Lovely series. I've only read Wicked Lovely, which I loved, and I've been meaning to catch up with the series for ages! Thanks for the giveaway :). Congrats on 1500! Big milestone! And holy cow, I love Melissa Marr. I started the Wicked Lovely series a few years ago but never really got into it. Maybe I should start it again this year! Yes. The Wicked Lovely series rocked! I've read the entire Wicked Lovely series and loved it. Yes! I've read almost the entire Wicked Lovely series and have loved them. I have read the first 3 books in the Wicked Lovely series and I enjoyed them very much! I tried her Blue Bloods series, but honestly didn't like it. But Carnival of Souls sounds like something different, and I'm also intrigued by her new Wolf Pact series. Ta=hanks for the awesome giveaway! I have her wicked lovely series on the shelf ready to read eventually. I've never read a book by Melissa Marr but Carnival of Souls sounds AMAZING!! I have not. Isn't that crazy? Get me started! I haven't read any books from the author yet, but I can't wait to read all of them! Thank you for offering a copy for the giveaway! The Wicked Lovely series, and Graveminder. Great giveaway and the chance. I have read her Wicked Lovely series. I haven't read Graveminder yet, but it's on my TBR list as well as Carnival of Souls. Thanks for the chance to win! Devoured the Wicked Lovely series! I have not but I'm always looking for new authors to read. Never. Carnival of Souls sounds fantastic though! I have read the first two of the Wicked Lovely series and Graveminder. I liked all of them and really want to finish the Wicked Lovely series. Thanks for the giveaway! I loved the Wickedly Lovely series! This one sounds so awesome though! I read Ink Exchange and absolutely hated it... that's my only Melissa Marr experience. But, since this is a new series that is different from the Wicked Lovely series, I am willing to give it a try. Thanksfor the giveaway! I haven't! I started reading Wicked Lovely but never finished. I was in a bit of a reading funk though. Thank you for the giveaway! I read the first three books of her Wicked Lovely series. No, still haven't, but this one sounds so amazing, so thanks for the giveaway & congrats on all the followers! The actual carnival sounds very cool and interesting. I also love multiple POVs and they all seem like great characters. It is too bad it is confusing. I have heard a lot of mixed things on this so far. I'm planning on just checking out the audio book when it becomes available.